Farmers' markets- one of the many things that make summer the best time of the year. Cherries- one of the many things that make the farmers' market the best place of the summer. Michigan- the place from which cherries burst forth. Cherries- one of the few things that make Michigan worthwhile. It's ambiguous purity is not one of those few things. Pie- the purest of desserts (I'm being ambiguous). 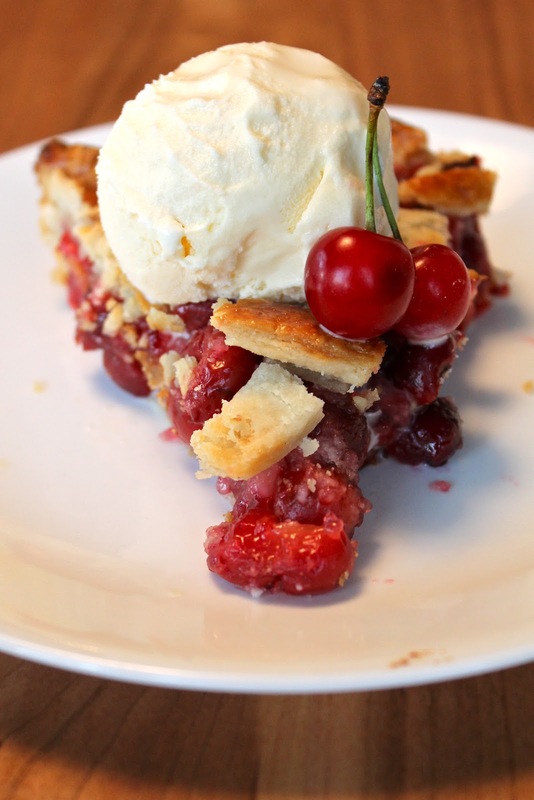 Cherries- the filling of the best pie the world has ever seen, lovingly created by the sisters Yammie and Nemo. Piggie and Tay, my younger sister and brother, are away at a church youth retreat for the week. This means my older sister Nemo and I are the only big kids here and thus have free reign over the kitchen and all surrounding areas. There has been much wild dancing to wild music. There has been buffoonery to the most extreme degrees. A constant flow of yummyness has been extruding from the oven. This is so that when Piggie and Tay return telling us what a marvelous time they had without us, we can tell them of our adventures. And they will never leave us again. Nemo was having trouble making her hand into a heart. As you can clearly see, my half of the heart on the left is quite exquisite, while Nemo's half is horrifyingly deformed. I was the only one who took this photo seriously. I even cleaned the fried chicken out of my fingernails before we took it. This pie, my friends, will possibly be the most glorious thing that will ever cross your lips. Nemo's crust was perfectly flaky and buttery. My filling had the perfect balance of sweet and tart. Eat it warm with a scoop of cold ice cream and your life will be complete. Put the shortening in the freezer for at least 15 minutes. Meanwhile, combine the flour and the salt. Add the cold butter and shortening and cut in with a pastry blender (or use a fork, your hands, or a food processor) until crumbly (mostly pea sized crumbs). Drizzle in the ice water, one tablespoon at a time, stirring quickly between additions, until you can press it into a mass. It will still be crumbly, but that's fine. Refrigerate for 1/2 hour. Then lightly flour and roll into two pie crusts. Cut one into strips for a lattice top. Press one crust into the bottom of the pie plate and poke a few times with a fork to prevent bubbles forming. 3 1/2 cups of fresh, tart cherries, pitted (we just cut a slit in the top and scooped out the pit with our fingers. If we were smart, we would probably have a cherry pitter). Combine all the filling ingredients and pour into the prepared crust. Weave the remaining strips across the top to form a lattice top. Brush the entire crust with a beaten egg for a shiny, golden brown crust. Bake at 425º for about 45 minutes or until the crust in golden brown and the filling is bubbly.